Our mission has withstood the extreme forces of nature in high winds, floods and blizzards, occasional equipment failures, an attempted firebombing, brutally high energy costs and many other challenges. With the Diocese of Fairbanks in Chapter 11 reorganization, we have another difficult situation to overcome. Donations to the mission have dropped, as many of our friends wonder how their gifts will be used. We pledge to you that all contributions to our mission will go directly to its operation, and we do need help right now, to allow us to pay our bills as we continue our award-winning work. We thank you deeply for your help and for your prayers. May God bless you for them! 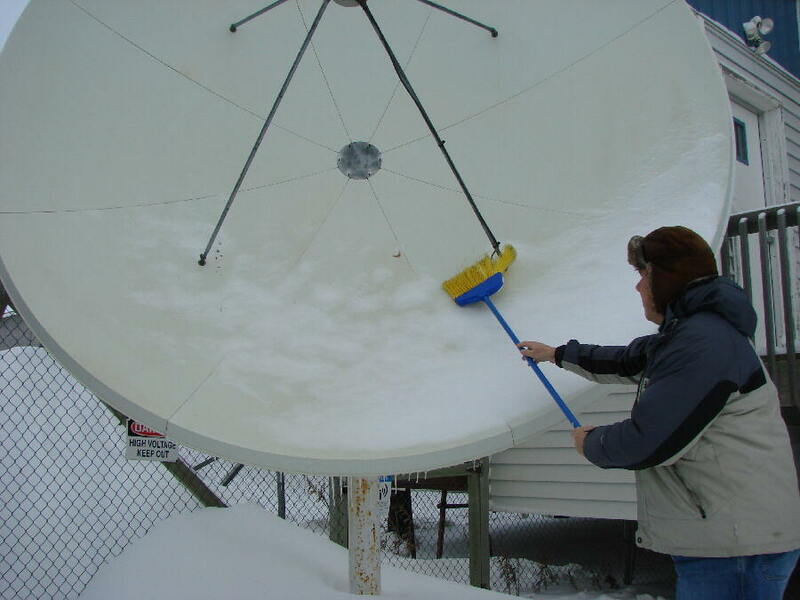 OTHER DUTIES AS ASSIGNED: (left) General manager Ric Schmidt clears snow from the satellite dish that provides KNOM hourly ABC Radio newscasts. As you can see, Nome's brutal wind patterns keep the ground fairly clear of snow in front of the dish, only a foot or so deep, but behind it, drifts routinely form to six and eight feet high. “ARF” AND “ARF” With a record 95 teams starting the 2008 Iditarod Sled Dog Race from Anchorage to Nome, KNOM staff had their hands full. As he has since 1998, news director Paul Korchin followed teams across the Alaska wilderness, and you’d see KNOMers at the finish line for many of the finishes. (Left) We don't have pictures of Paul on the trail this year, but here's an image of him in 2005, getting to know some of the canine athlete's at the race's start. You might ask, why does a Catholic radio station cover a dog race? It’s simple: to keep our large audience listening, so they can benefit from our other offerings, and attract new listeners, too. Further, our coverage helps people focus on a positive and exciting event, working to improve a period that used to be known as “suicide season” in Western Alaska. Thank you for helping. The oldest Catholic radio station in the United States, thanks to you. INSPIRATIONAL SPOT: Humans judge by the success of our efforts. God looks at the efforts. ICK: (left) Laura Davis discovers that the volunteer house clothes washer has finally worn out. It’s the third appliance in the building to do so. 16 years old, it has probably cleaned about 5,000 loads of laundry. We offer special thanks to the couple who sent a $500 contribution that paid for its replacement. 11,300: That’s about how many inspirational spots KNOM has broadcast so far during 2008, as well as an equal number of educational ones. According to audience measurement surveys, so far this year, the average listener has heard about 2,000 of each, thanks to you. Thank you! ANSWERS TO YOUR QUESTIONS: Why are prices so high in Nome? What is the cost of living? During the brief summer, when the Bering Sea is ice-free, nonperishable items can be shipped to Nome by oceangoing barge from Seattle. But during the long winter, the only method is by air freight, which adds more than a dollar per pound to the cost of everything. Electricity is generated by diesel fuel, which is now $4.49 a gallon. The fuel is shipped by tankers from Long Beach, California. According to the University of Alaska’s Cooperative Extension Service, the cost of food in Nome is 206% that of Portland, Oregon, which is their benchmark. Electricity is almost triple. At the KNOM mission, you can be assured that we pinch our pennies. Thank you for making our work possible! INSPIRATIONAL SPOT: The only survivor of a shipwreck found himself washed up on a small uninhabited island. He prayed feverishly for God to rescue him, but no one came. He eventually managed to build a little hut out of driftwood, for protection and to store his few possessions. But then, one day, after looking for food, he arrived home to find his little hut in flames, smoke rolling into the sky. The worst had happened. He had lost everything. The man was stunned with grief and anger. Early the next day, however, a ship approached the island. It had come to rescue him. “How did you know I was here?” he asked. “We saw your smoke signal,” they replied. The next time your little hut is burning to the ground…it just may be a smoke signal that summons the grace of God. INSPIRATIONAL SPOT: God chooses the last to be first. God chooses us not because of our abilities, but because of our inabilities, and our willingness to give glory to Him. Give God your best try. Let Him do the rest. CONCENTRATING: (left) Preparing for the 4:55 PM expanded regional newscast, Amy Flaherty concentrates on a news story. This picture was taken through the newsroom window, from outside, where the temperature was +10� and the wind blowing at about 30 MPH. EDUCATIONAL: In KNOM’s first years of broadcast, starting in 1971, KNOM’s educational spots were simple, and necessary. Brush your teeth. Wash your hands after using the honey bucket or changing a diaper. Over nearly two generations, our audience has grown with us, and our spots have become more sophisticated. youth job opportunities, among others. Thank you once more for your role in presenting this information to the far-flung, remote families whom we serve. If they could, they would thank you, too. COMMISSIONER: In March, Alaska Governor Sarah Palin appointed 30-year KNOM general manager, now financial officer, Tom Busch, to the Alaska Public Broadcasting Commission. The board regulates state funding to public radio and television stations. PLEASE CONSIDER adding the KNOM mission to your will. We prayerfully add all bequests to funds that are used only for emergencies or for major projects. INSPIRATIONAL SPOT: Faith is a natural thing. You get on a plane, snap together the seat belt, while the plane carries you miles into the sky at hundreds of miles an hour, without worry. You fall asleep. You have faith! All of us have faith. The question is not whether we have it, it’s where are you going to put it? INSPIRATIONAL SPOT: We should learn from the mistakes of others. We cannot possibly live long enough to make all of the mistakes ourselves! 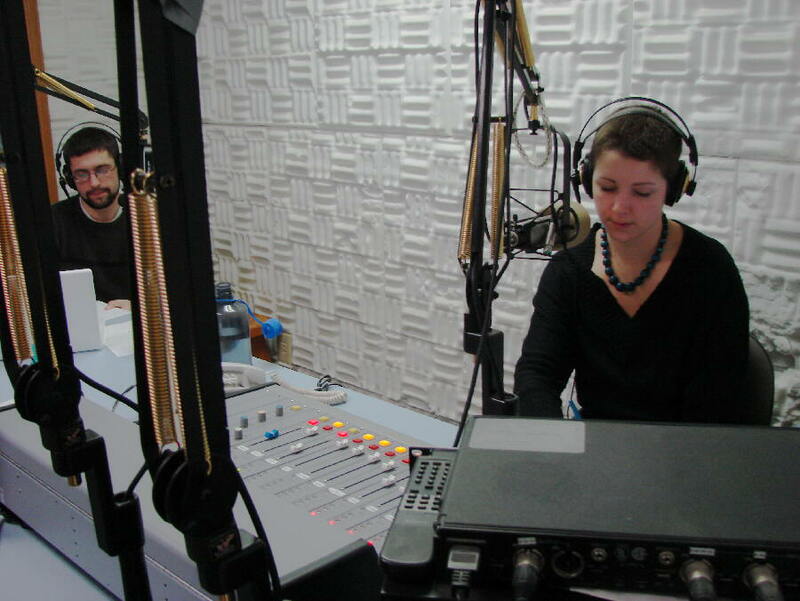 LISTENING: (left) Volunteers Jacob Buckenmeyer and Laura Davis listen to a caller’s comments during a KNOM “Sounding Board” program in March. 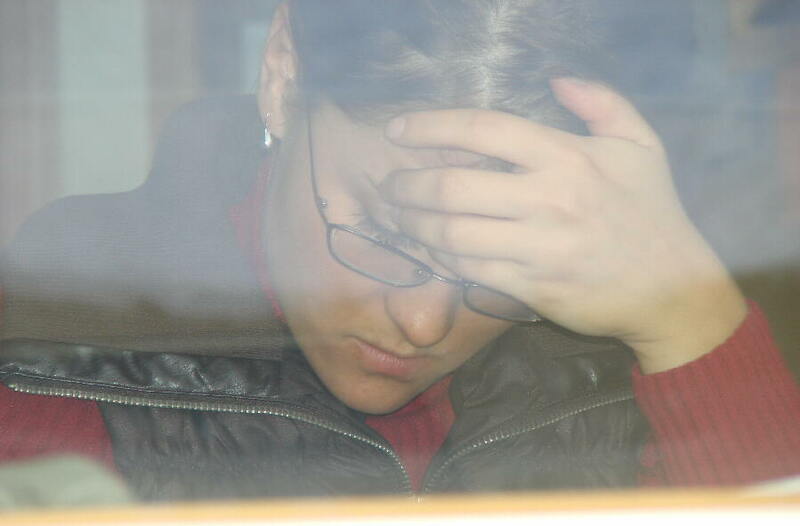 Laura produced the show on the topic of school violence, which has become a problem in some villages. “I expected they would talk about concrete school issues,” Laura says, but instead, many callers brought up the fact that children need attention and love in their homes. KNOM’s call-in programs are unusual, in that they treat all participants with respect and dignity. FORTY YEARS AGO: In April 1968, Bro. John Huck, SJ is head of the roving diocesan construction crew. He’s in Nome remodeling the kitchen of St. Joseph Parish’s rectory, gathering center for the small group that spearheads the Catholic radio project. The future station continues to be stalled by federal paperwork. 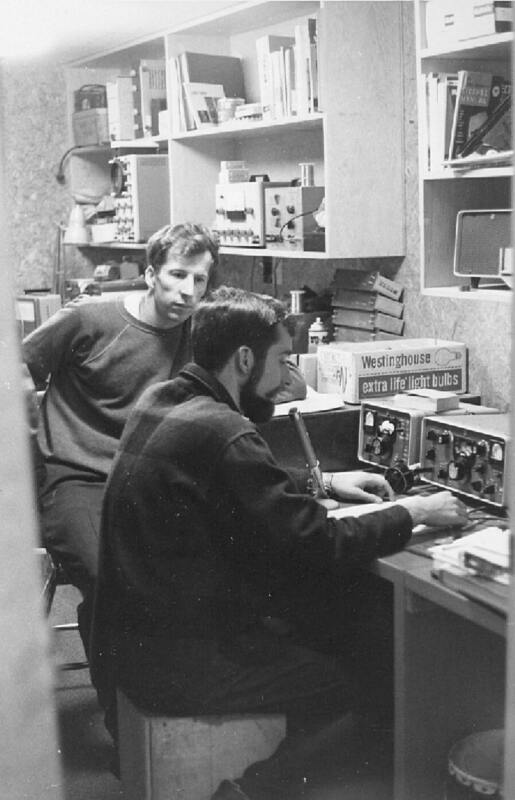 (Left) Volunteer Alex Hills, at the ham radio controls in the KNOM engineering room, connects Bro. Huck with his family in Yakima, Washington. The photo was taken in 1970. THIRTY-FIVE YEARS AGO: In April 1973, Eskimo fox hunters from the Russian Far East meet with Diomede Islanders on the Bering Strait ice at the International Dateline, exchanging family news and gossip, dried fish, tobacco, chewing gum, sewing needles and other small gifts. The Natives on both sides of the border are related, though international tensions have prevented formal contact since 1947. Through this visit, KNOM learns that in addition to being immensely popular in Alaska, its signal penetrates 1,000 miles into Russia, where it’s been enjoyed and appreciated since signing on in 1971. (Left) The village of Little Diomede, at right, clings to a rocky island just a stone's throw from Russia's Big Diomede Island, at left. This image was taken by KNOM volunteer Clinton White in 2005. SOME FRIENDS of our mission have been with us for almost 42 years. Some are brand new. To each, we continue the solemn pledge that we will never provide your name and address to anyone for any reason. We also pledge prayer for you, for your intentions and your loved ones. We are just on the front lines — it is you whom we consider this vitally important mission’s strength, thanks to your concern for the isolated people whom we serve, and your gifts and prayers for everyone in the KNOM family. From the bottom of each of our hearts, we thank you. May Our Heavenly Father bless you greatly. Copyright � 2008 KNOM. All rights reserved.